Stroke is a brain injury caused by an interruption in blood flow. Brain tissue that does not get oxygen and nutrients from blood can die within minutes. The damage to the brain can cause a sudden loss in bodily functions. The types of function that are affected will depend on the part of the brain that is damaged. 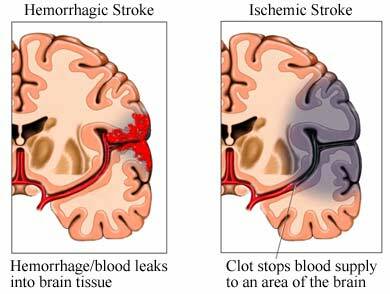 An ischemic stroke is caused by a blocked blood vessel. Blood disorders or medications can make it harder for you blood to clot. This can also increase your risk of a hemorrhagic stroke. A physical exam will be done. The doctor will look for muscle weakness, visual and speech problems. If possible, the doctor will ask about your symptoms and medical history. A CT scan may be done to confirm the diagnosis. Blood tests will also be done. Tests will show how well the blood can clot. Your doctor may also examine the fluid that surrounds your brain and spine. Brain tissue without blood flow dies quickly. Immediate treatment is needed to stop the bleeding and relieve pressure on the brain. You may be given medicine to help your blood clot. This may also include vitamin K. It may be needed if you were taking medicine to reduce clots. Surgery may be done to help stop the bleeding. Some may be done through catheters. The catheter is placed into blood vessels of the groin and passed to the vessels in the brain. For a burst aneurysm—A clip may be placed just before the damaged vessel. It should stop the bleeding. For a leaking or aneurysm that has not burst—A special coil may be placed in the weak area. The coil will help a clot to form over the area. It will prevent bleeding. A clip may be used instead of a coil. For an abnormal tangle of blood vessels—Surgery may be done to repair the blood vessels. It may be able to remove the tangles or reroute the blood around the area. The stroke and damaged tissue can cause swelling in the brain. Surgery may be needed to relieve the pressure. One common option is to remove a section of the skull. This is called a craniotomy . Understand what risk factors you may have for stroke. Manage and monitor medical conditions that that increase your risk. This includes aneurysms and high blood pressure. Eat more fruits, vegetables, and whole grains. Limit salt and fat in your diet. If you smoke, talk to your doctor about ways to quit. Limit alcohol. This means no more than 2 drinks per day for men and 1 drink per day for women. Check blood pressure often. Follow your doctor's advice for keeping it in a safe range. Do not use recreational drugs, such as cocaine. Hemorrhagic strokes (bleeds). American Heart Association American Stroke Association website. Available at: http://www.strokeassociation.org/STROKEORG/AboutStroke/TypesofStroke/HemorrhagicBleeds/Hemorrhagic-Strokes-Bleeds%5FUCM%5F310940%5FArticle.jsp#.VzOxL02FPIU. Updated May 21, 2018. Accessed June 14, 2018. Hemorrhagic stroke. The Children’s Hospital of Philadelphia website. Available at: http://www.chop.edu/conditions-diseases/hemorrhagic-stroke#.VzOxRk2FPIV. Accessed June 14, 2018. Hemorrhagic stroke. National Stroke Association. Available at: http://www.stroke.org/understand-stroke/what-stroke/hemorrhagic-stroke?pagename=HEMSTROKE. Accessed June 14, 2018. Intracerebral hemorrhage. EBSCO DynaMed Plus website. Available at: https://www.dynamed.com/topics/dmp~AN~T115590/Intracerebral-hemorrhage . Updated February 26, 2018. Accessed June 14, 2018. Liotta EM, Prabhakaran S, Sangha RS, et al. Magnesium, hemostasis, and outcomes in patients with intracerebral hemorrhage. Neurology. 2017;89(8):813-819. Stroke (acute management). EBSCO DynaMed Plus website. Available at: https://www.dynamed.com/topics/dmp~AN~T143427/Stroke-acute-management . Updated March 19, 2018. Accessed June 14, 2018. Stroke treatments. American Heart Association American Stroke Association website. Available at: http://www.strokeassociation.org/STROKEORG/AboutStroke/Treatment/Stroke-Treatments%5FUCM%5F310892%5FArticle.jsp#.VzOxrE2FPIU. Accessed June 14, 2018. Subarachnoid hemorrhage. EBSCO DynaMed Plus website. Available at: https://www.dynamed.com/topics/dmp~AN~T116453/Subarachnoid-hemorrhage . Updated June 6, 2018. Accessed June 14, 2018. 8/11/2015 DynaMed Plus Systematic Literature Surveillance https://www.dynamed.com/topics/dmp~AN~T115600/Obstructive-sleep-apnea-OSA : Molnar MZ, Mucsi I, Novak M, et al. Association of incident obstructive sleep apnoea with outcomes in a large cohort of US veterans. Thorax. 2015;70(9):888-895. 1/18/2017 DynaMed Plus Systematic Literature Surveillance https://www.dynamed.com/topics/dmp~AN~T113766/Coronary-artery-disease-possible-risk-factors : Emdin CA, Odutayo A, Wong CX, Tran J, Hsiao AJ, Hunn BH. Meta-analysis of anxiety as a risk factor for cardiovascular disease. Am J Cardiol. 2016;118(4):511-519.